With four films hitting theaters nationwide early for Thanksgiving weekend, Disney’s “Ralph Breaks the Internet” and MGM’s “Creed II” both came out of their corners swinging. 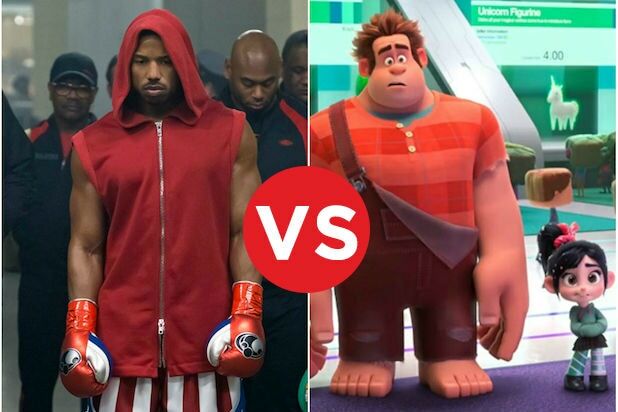 The “Wreck-it-Ralph” sequel earned $3.8 million from Tuesday night previews, and “Creed II” was just behind it with $3.7 million. Both numbers amount to the best showings for Thanksgiving previews ever. The preview for “Ralph Breaks the Internet” surpasses Disney’s other recent Thanksgiving releases, including “Coco” ($2.3 million) and “Moana” ($2.6 million). As with all family releases, this sequel to “Wreck-It Ralph” is expected to make the majority of its grosses from matinee and weekend screenings. It’s projected for a $68-75 million five-day opening, up from the $49 million three-day opening of its 2012 predecessor. As for “Creed II,” its predecessor also opened on Thanksgiving weekend in 2015 and earned $1.4 million from Tuesday previews and went on to earn a $42 million five day opening and a $109.7 million domestic run. “Creed II” is projected to slightly improve on that figure with a $50 million start. While critics say it’s not as good as the first “Creed,” they’ve given positive reviews with an 81 percent Rotten Tomatoes score. “Creed II” sees Michael B. Jordan return as the late Apollo Creed’s son, Adonis, as he continues to rise up the boxing ranks with Rocky (Sylvester Stallone) and his girlfriend Bianca (Tessa Thompson) by his side. But the good times are cut short when Adonis is challenged by Viktor Drago (Florian Munteanu), son of Ivan Drago (Dolph Lundgren), the man who killed Apollo in a fight 33 years ago. Phylicia Rashad and Milo Ventimiglia also star, with Steven Caple, Jr. directing and original “Creed” director Ryan Coogler producing. “Ralph Breaks the Internet” sees John C. Reilly return as the titular video game baddie, who accidentally breaks Vanellope’s (Sarah Silverman) arcade game in an attempt to cheer her up. When they discover that the only replacement part for the game is being auctioned on eBay, the two head off to the Internet to find it. Bill Hader, Gal Gadot and Taraji P. Henson also star, with Alfred Molina, Jack McBrayer and Jane Lynch rounding out the cast. The film has a 92 percent Rotten Tomatoes score. Also opening this weekend, “Robin Hood,” from Lionsgate’s Summit Entertainment, grossed $800,000 at over 2,100 locations on Tuesday. The film also grossed an additional $400,000 from Monday night paid promotional screenings, with a total of approximately $1.2 million over the two days. The film will open in 2,715 locations today and will increase to 2,827 locations by Friday. The film is projected for a $15 million 5-day opening on the back of a budget just shy of $100 million. In comparison, Guy Ritchie’s “King Arthur: Legend of the Sword” from last year, one of the largest bombs of 2017, only made $1.15 million in its previews before opening to $15 million. “Robin Hood” stars Taron Egerton and Jamie Foxx in a modernized retelling of the legend and origin story of Robin of Loxley. Directed by Otto Bathurst, the film has only an 18 percent score on Rotten Tomatoes.